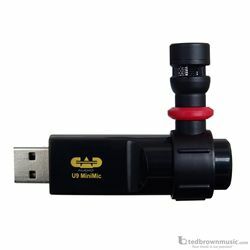 The CAD Audio U9 USB MicroMic is a great high quality, compact solution for recording on the go. It features a small compact design, with a huge sound and a 3.5mm(1/8”) headphone out jack for monitoring. The 180 degree swivel and omni direction capsule allows for precise placement and maximum sound quality while podcasting, Skyping, VoIP or recording music.